some time ago I mentioned receiving a copy of a smartly published - Soldiershop Publishing from Italy in 2014 - Osprey-size volume titled ''Der lange Turkenkrieg (1593-1606) vol. 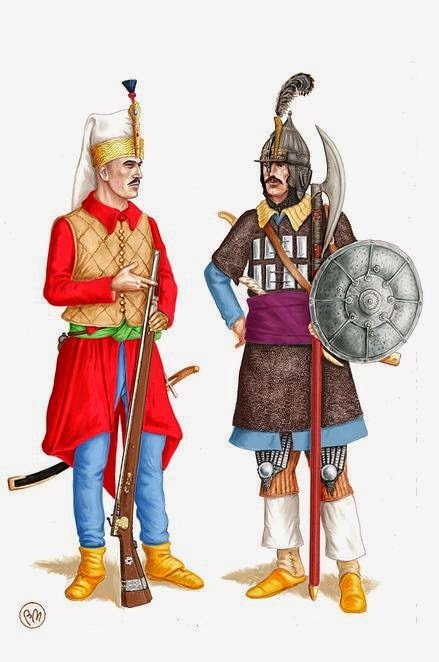 I'' or ''La Lunga Guerra Turca/ The Long Turkish War.' It can be had in an e-book format too. So I am going to write my two cents about this publication, especially since the second volume should be coming out shortly this year. This book is part of the general series titled 'Soldiers & Weapons,' hence numbered 24, its ISBN 979-88-96519-69-1, authored by two writers and artists Chris Flaherty and Bruno Mugnai. It is 82 pages long and printed on a very, very good quality paper, much better than Osprey's men-at-arms et al., with a crisp and very clear typeset, thus all the black-and-white period illustrations are also very clear and sharp, even the small ones. And illustrations are aplenty inside the book, but I am getting ahead of myself. The text is bilingual, in Italian (left side of each page ) and English (on the right) (in case of illustrations the Italian text first and under it the English one), with very, very few typos in English (I cannot vouch for Italian), easy to follow and one could attempt to learn some Italian from this presentation :) . There is half page big order of battle - Ottoman victory at the battle of Keresztes 24th October 1596 ( but battle of Sisiak is also described); also only one and rather small map showing the theater of this war - the Ottoman-Habsburg borderlands in Hungary, Croatia etc. one set, painted by Bruno Mugnai, numbered from A to H, this set has a separate chapter of commentaries on illustrations at the end of the book. 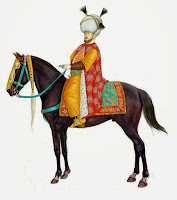 second set - colored line diagrams drawn by Chris Flaherty (I am presuming based on the copyright mark) consisting of 3 plates with text - one showing Ottoman war wagon. I particularly like the 8-plate sets painted by Bruno, a Florentine artist, with a list of previous publications on the European and other military history. There is lots of information inhere and the size, albeit a bit smaller than typical Osprey, is still big enough to give you plenty of information of their equipment, even the individual soldiers features etc. I may not agree with all the information collected and presented but I do like the result and give it a very high note. 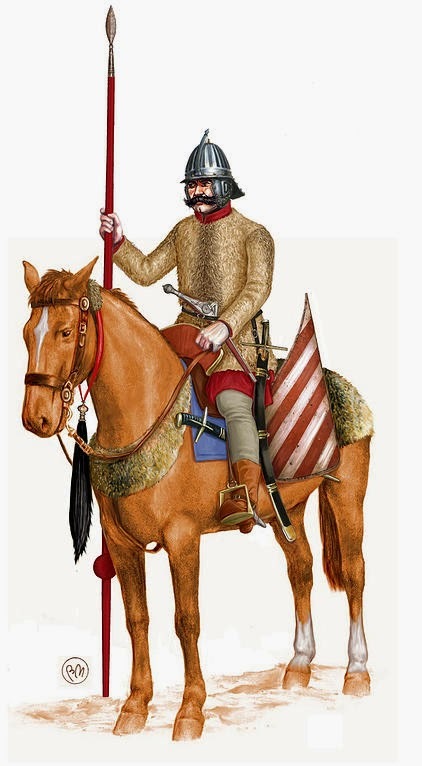 Note that this is the period when the Hungarian and Transylvanian hussars were very similar to the Polish winged hussars. So,summing up, the text devoted to this conflict is very clear and concise and completely focused on the subject of the Long War, it being rather very arcane to an American or British Commonwealth reader, and I learned a bit there too. While the historical prints and modern illustrations complement the text and enrich many a reader understanding of this conflict and visualization of the warring sides. Second volume becomes a must for me, having whetted my appetite on the first one. I give this book out of 10 points a high note of 8, I would favour larger map/s, more orders of the battle sequences, and larger illustrations - all could be accomplished by enlarging the book to an Osprey -warrior series size, or by about 2 cm in width and 1cm in height. Bruno Mugnai holds the copyright to these images. Czyli co, warto kupić? Wiesz może w jakim formacie jest e-book?